As a follow-up to its ‘Kargil Calling - Ride for the Real Stars’ initiative, TVS has now announced a 'Kargil Edition' of the Star City+. 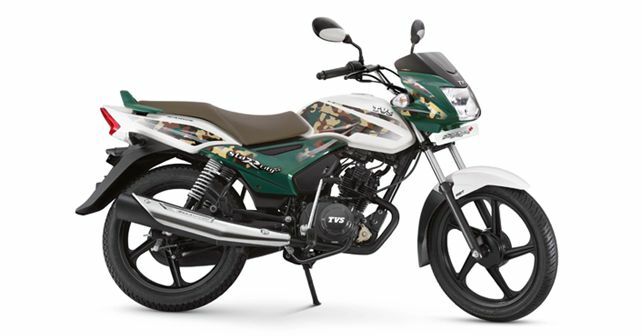 TVS Motor Company has announced a 'Kargil Edition' of its Star City+ commuter motorcycle in India. The special edition pays a tribute to the indomitable spirit and attitude of the Indian soldier and consequently, salutes the entire Indian army for its constant service to the country and its citizens. The 'Kargil Edition' draws its inspiration from the natural habitat of the Indian soldiers, that is, from the snow peaks and rough terrains of the Indian mountain ranges. Thus, the white and green dual-tone colour scheme, along with camouflage graphics aptly describes and presents the spirit of the Indian army. A special 'Kargil Emblem' at the back of the bike further connotes the respect of the bike manufacturer to the Indian soldiers. The Star City+ Kargil Edition is a follow up to TVS' ‘Kargil Calling - Ride for the Real Stars’ initiative which was aimed at celebrating the contribution of the Indian Defence Forces on Kargil Vijay Diwas (July 2018). As the initiative drew a lot of attention from the customers, TVS felt that they had to reciprocate in the form of a special edition bike. Coming to the bike itself, the mechanical specs of the Kargil Edition remain the same as the standard Star City+ motorcycle. The only changes made to it are all aesthetic in nature. The motorcycle features new decals, which are a combination of the three colours: Naval White, Soldier Green and Flying Blue. While the TVS Star City+ Kargil Edition is priced at ₹ 54,399 (ex-showroom, Delhi), it will only be available across select TVS dealerships in the country.